This guy is 69 years old, but half of his face looks much, much older than that. He was a trucker and, for 28 years, his face received much more sunlight on the left side, resulting on premature aging. We all knew that being exposed to the sun makes you age prematurely, but seeing the dramatic difference in a single face is just stunning. His condition is called unilateral dermatoheliosis, from the Greek dermis and helios, skin and sun. It's also called photoaging, and it results from chronic exposure to the sun's UVA and UVB rays. In his case, it only affected the left side of his face because of his work. As he drove, he received much many hours of sunlight through the left window of his vehicle. 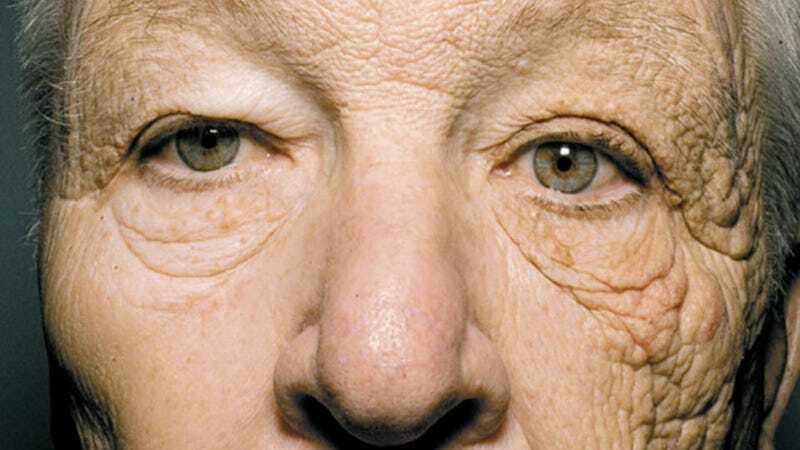 A 69-year-old man presented with a 25-year history of gradual, asymptomatic thickening and wrinkling of the skin on the left side of his face. The physical examination showed hyperkeratosis with accentuated ridging, multiple open comedones, and areas of nodular elastosis. Histopathological analysis showed an accumulation of elastolytic material in the dermis and the formation of milia within the vellus hair follicles. Findings were consistent with the Favre–Racouchot syndrome of photodamaged skin, known as dermatoheliosis. The patient reported that he had driven a delivery truck for 28 years. Ultraviolet A (UVA) rays transmit through window glass, penetrating the epidermis and upper layers of dermis. Chronic UVA exposure can result in thickening of the epidermis and stratum corneum, as well as destruction of elastic fibers. This photoaging effect of UVA is contrasted with photocarcinogenesis. Since UVB and UVA can cause DNA mutations leading to skin cancer, the doctors recommended their patient to use sun protection and topical retinoids, as well as periodic monitoring for the apparition of skin cancer.